Mynard, J. (2010). Editorial. Studies in Self-Access Learning Journal, 1(3), 158-160. 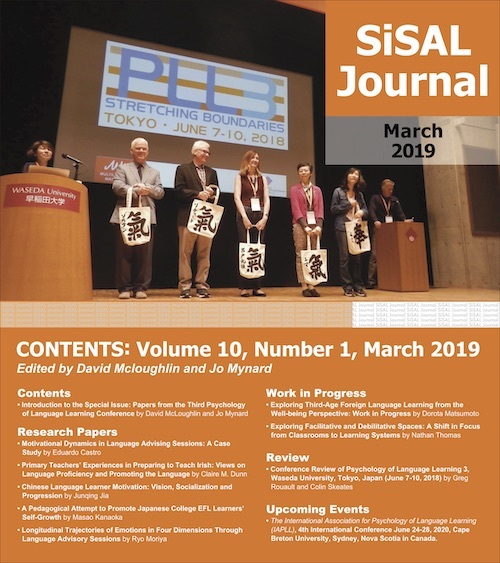 Welcome to the December 2010 issue of SiSAL Journal, a publication set up this year to disseminate ongoing research and practice within the field of self-access and out of class learning support. The journal is an online, open access publication whose pages receive, on average, around fifty views per day. The journal was recently evaluated by several indexes for suitability for inclusion. I am delighted to report that SiSAL Journal will be indexed by Academia.edu, DOAJ (Directory of Open Access Journals), EBSCO Publishing, Open J-Gate (open-access movement for scholarly journals), Ulrich’s Periodicals Directory and WilsonWeb Journal Directory. It is also available for download as an e-book on amazon.com and amazon.co.uk. The current issue is dedicated to the theme of motivation and beliefs and there are five full articles in the issue all investigating the area from a unique angle. Gardner & Miller suggested back in 1997 that more research into learners’ beliefs and motivation for self-access use should be conducted, but only a few studies have been published since then. More work is still needed to inform our understanding and clearly this is a task beyond the scope of one special issue of SiSAL. The contributions do however contribute to our understanding of these complex areas by attempting to tackle questions such as: what to stakeholders believe is the purpose of a self-access centre? Why do students choose to come to a SAC and why do other learners avoid it? What do learners feel is the best way to learn and how are these beliefs transferred to self-access learning? It is appropriate that David Gardner and Lindsay Miller start off this issue by reviewing fifteen years of stakeholder beliefs about self-access in Hong Kong. They focus on the four key belief areas of materials, integration, motivation and effectiveness and find that there has been a considerable shift in thinking over time. They also find that some areas continue to remain under-researched and therefore less well understood. Continuing with the investigation of stakeholder beliefs, in their article John Adamson, Howard Brown, and Naoki Fujimoto-Adamson use the dialogic process of a series of conversational narratives to present perceptions of the purpose of a new self-access centre in Japan. The reported dialogues enabled the researchers to investigate the following areas: metaphors of self-access, language policy, its integration with university curricula, and how it and its staff are positioned in the organization. Hamish Gillies looks into reasons why students decide to use or avoid a self-access centre at a university in Japan. The key themes which emerged from the author’s qualitative data were: the SAC as an environment; the SAC as a community of selves; and the SAC as contrasted with the classroom. The author cites identity, motivation and strong ideal L2 selves rather than language proficiency as factors predictive of SAC use. Qunyan Zhong reports on a study which used a naturalistic inquiry approach to investigate five Chinese ESL learners’ beliefs about language learning and their learning behaviour. Although the article is not specific to self-access learning but applies to learning in general, the research certainly sheds light on how learner beliefs about language learning impacts self-directed study. In the final article, Juan Pablo Alcaraz Lagarriga takes a look at learner beliefs about ways to improve speaking skills as part of a self-directed learning course in Mexico. The author draws on four case studies in order to follow students’ progress with self-directed speaking development and finds that the students’ beliefs seem to hinder their progress. Jo Mynard is the Director of the Self-Access Learning Centre and Assistant Director of the English Language Institute at Kanda University of International Studies in Japan. She holds an Ed.D. in TEFL from the University of Exeter, UK and an M.Phil. in applied linguistics from Trinity College, Dublin. She has taught EFL in Ireland, Spain, England, the UAE and Japan, and has been involved in facilitating self-access learning since 1996. Gardner, D., & Miller, L. (1997). A study of tertiary level self-access facilities in Hong Kong. Hong Kong: City University. Many thanks to the contributors for choosing to submit their work to SiSAL Journal, to the reviewers who gave useful and timely feedback and to the editorial team for their input, support and sharp-eyed editing skills.